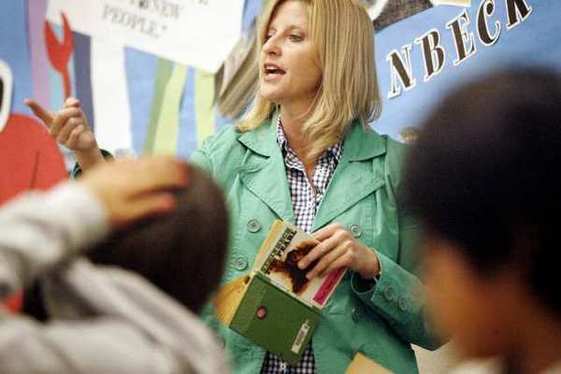 In an interview with Patt Morrison of the LA Times, National Teacher of the Year Rebecca Mieliwocki describes how she borrows a Story Corps strategy to teach her middle school students a powerful lesson -- one that will never be on any standardized test. Teachers in Marion City Schools (Ohio) have begun collaborating to improve student learning. To ensure this important work continues to be a priority, the district is closing school 40 minutes early on Wednesdays. During the day, teachers work together in professional learning communities to review student data and develop strategies to improve academic performance. Read Kurt Moore's article in the Marion Star. In a related story, Teach Plus recently issued a report about outcomes in schools working in partnership with its Turnaround Teacher Teams (T3). Their report, T3 Closing the Gap, indicates that their approach to teacher teaming has made a positive impact on learning in Boston City Schools. According to the report, the six schools participating in T3 during the 2010-11 and 2011-12 school years are accelerating student achievement across grade levels in both English language arts (ELA) and math. In grades 3 to 8, T3 Initiative partner schools are seeing greater student achievement gains than their counterparts in Boston Public Schools and the state’s pool of “turnaround” schools. These promising results, though not showing a causal link, speak to the power of teacher leaders working together to ensure that the city's students with the highest needs have access to quality education. Read the Hechinger Report article about T3. English teacher and Teaching Ambassador Fellow Dan Brown sat down with Arne Duncan to talk about the tragedy in Newtown, Conn., and to discuss what educators can do to keep children safe from violence on campus. Watch the video and read the blog. U.S. high school graduation rates have risen to a 40-year peak of 78.2%, and data suggests that the 10-point surge in Hispanic graduation rates may be driving the improvement. While educators everywhere are heartened by the good news, Secretary Duncan remains focused on continued improvement and on closing achievement gaps. While the report shows that more students graduate on time, only 66% of black students and 69% of Native American students do. Read the story in Reuters. Read Duncan's statement. Review the NCES report. Mike at the Mic. Mike Petrilli from the Fordham Institute recently testified before the Indiana legislature, arguing that the state should stay the course on the Common Core State Standards. His testimony provides a great read. Preparing for Lower Test Scores (as States Raise the Bar). A Simple Choice Of Words Can Help Avoid Confusion About New Test Results, posted on the Shanker Institute's blog, suggests states, schools, and districts should anticipate lower scores from the assessments of the states' Common Core standards. The predicted lower scores remind Matt DiCarlo of the1998 National Institutes of Health (NIH) report that lowered the threshold for overweight individuals. "Literally overnight, about 25 million Americans previously considered as having a healthy weight were now overweight. If, the next day, you saw a newspaper headline that said the ‘number of overweight Americans increases,’ you would probably find that a little misleading. America’s ‘overweight’ population didn’t really increase; the definition changed." Career and Techinical Education (CTE) encompasses 94 percent of high school students and 13 million postsecondary students. Students taking CTE courses are less likely to drop out and are more likely to pursue postsecondary education. In programs where rigorous academics and CTE are integrated, CTE students have significantly higher achievement in reading, math and science than do students at schools with less integrated programs. For more information, visit ED's Career and Technical Education website. In recent polls, teachers have said they anticipate innovations in technology to greatly change their teaching in the next decade. Here are a few resources to help teachers connect. √ Participate in Digital Learning Day, February 6. √ Read about how Huntsville, Ala., is leading one of the largest school district transitions to digital learning in the nation. √ Check out a new report from the Department on Expanding Evidence Approaches for Learning in a Digital World. √ Connect with iMentor, a school-based mentoring program that uses digital learning to improve student behavior and increase college access. Their internet-based systems help train and support adult volunteers, who mentor students both virtually and in-person. √ Peruse other resources available from the Office of Educational Technology's website. COMMUNITY SERVICE. Check out Corporation for National and Community Service, a federal agency that engages more than five million Americans in service through Senior Corps, AmeriCorps, and Learn and Serve America. Find out more about answering President Obama's national call to service, United We Serve. YOUTH VOICES. Encourage students to get involved in education by connecting with the Youth Engagement Offices at the Department of Education and at the White House. 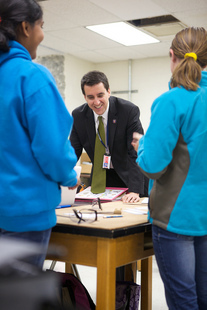 Students can sign up for White House Youth Updates, sign up for ED's Youth Voices newsletter, email the White House Office of Youth Engagement, or follow the White House Director of Public Engagement Jon Carson on Twitter @JonCarson44. A University of North Carolina study of Georgia's early learning program indicates that the state's efforts are paying off for students. State officials are reporting that early data indicate that students who went through Georgia pre-kindergarten program fared better than their national peers on almost every measure, including mathematics and reading. Read the article in the Atlanta Journal-Constitution (Badertscher). Read Sara Mead's answer to critics of early learning programs. In Edweek, Mead argues that "the evidence base about the beneficial impacts of quality pre-k--particularly for low-income children--is one of the most robust anywhere in education." In Stories from School, read teacher and Teaching Ambassador Fellow Cheryl Redfield's (Mesa, Ariz.) blog about her experience traveling Arizona to discuss the RESPECT Project with educators, including what she learned by listening to them. President Barack Obama in his January 21 Inaugural Address. Of the 4,730 people who earned a doctorate degree in the physical sciences, 142 were African American, 13 were American Indian or Native Alaskan, and 212 were Hispanic. Of those earning a PhD in engineering, 133 were African American, seven were American Indian or Native Alaskan, and 93 were Hispanic. Folks at Bellwether point out in their Eduwonk blog that it’s more likely for an African-American male to end up in the NFL each year than to earn a doctorate in a science, technology, engineering, or math STEM discipline. From http://www.nsf.gov/statistics/sed/2011/pdf/tab23.pdf. • ADVICE FROM TEACHERS. The Teaching Channel has revamped their site so that it now includes a place for teachers to ask questions and get advice from other educators. One teacher asked about good read-aloud texts for middle school and another asked about the usefulness of software to detect plagiarism. It is worth checking out. • TESTING ELL MATERIALS FOR THE COMMON CORE. Learn about how emerging English language learners in Chicago (Ill.), Denver (Co.), and Charlotte (N.C.) are reading King's "I Have a Dream" speech and Lincoln's "Gettysburg Address" in the original texts, rather than the watered-down versions often taught to them. Their work is part of a pilot study about teaching the states' Common Core standards. Read the EdWeek article (Maxwell). • SUMMER BRIDGE WEBINAR. The School Turnaround Learning Community is sponsoring the Ninth Grade Counts: Summer Bridge webinar live at 4 PM EST on Wednesday, January 30. Register here to participate. • WHEN ELEPHANTS FIGHT... Educators for Excellence (E4E)-NY Executive Director Jonathan Schleifer discusses NYC's failed evaluation talks and makes a pretty good case that it is the children who suffer when the adults in the room refuse to act in their interest. Schleifer's interview with NY1's The Call is worth a listen. Earlier, E4E educators held a rally urging the United Federation of Teachers and the city to come to agreement on a fair and useful teacher evaluation system. "We are not satisfied with being satisfactory," Evan Stone said in this NBC news report. • TIMELY, TEACHABLE VIDEOS: C-SPAN Classroom offers a series of free videos and other resources for teachers to use in their classrooms (such as the official swearing in of the President) or to inform their pedagogy (a conversation about the Education System Reform with superintendents and other education leaders). Teachers may also register to receive lesson plans and bell-ringers. The WWC has reviewed recent research on promising practices that may interest teachers. One report finds that enVisionMATH (published by Pearson) has potentially positive effects on mathematics achievement at the elementary school level. Another study determines that the Talent Development Middle Grades Program boosts adolescent reading comprehension in grades 7 and 8 in urban middle schools in the Northeast. Teachers Speak Up is a new webpage that gives voice to teachers who want to think creatively about the profession. Their goal is to help politicians and the public make better decisions about education. • SAFE SCHOOLS. In 2000, the National Association of State Boards of Education published a school health policy guide: Fit, Healthy, and Ready to Learn. Chapter I describes Practices to Promote Safety and Violence Prevention that are relevant today. Download an electronic version or link to the PDF of the chapter at the bottom of this page. • GIFTED, TALENTED AND SEGREGATED? Interesting editorial in the NY Times (Baker) about the racial disparity that often pervades gifted and talented classes. • TROOPS TO TEACHERS. Inspiring article in USA Today (Toppos) about schools tapping into our nation's veterans to put their skills to work in the classroom. According to the vets, they fit because they are used to working in high-stress environments. 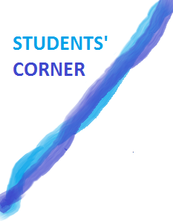 Teaching Matters contains links to other websites and news articles. These links represent just a few examples of the numerous education reference materials currently available to teachers and the public. The opinions expressed in any articles or web pages do not necessarily reflect the positions or policies of the U.S. Department of Education. The inclusion of resources should not be construed or interpreted as an endorsement by the U.S. Department of Education of any private organization or business listed herein.